Are you on the market for a new mattress but discouraged by the high prices? Indeed, buying a new mattress can wreck havoc on your budget. Mattresses don’t sell for a hundred bucks. But the good news is that you can improve the surface of your bed by buying a mattress pad instead of a mattress. A mattress pad is more than 50 percent cheaper than a mattress. And you don’t have to replace the mattress you bought a couple of years ago. Moreover you can choose a mattress that suits your taste. Whether you want an extra soft or firmer sleeping surface, you can get that with a new mattress pad. The Extra Plush, Bamboo Top Fitted Mattress pad from ExceptionalSheets is a good choice if you are to ask us of a mattress pad. Many Amazon.com reviewers agree with us. In fact it is among the highest rated mattress pads on the popular online store. Made of natural bamboo fiber, this mattress will keep your mattress cool. You won’t sleep hot on this mattress. It is also very luxurious, which would remind you of the beds you used to sleep on in a five-star hotel. There are eight sizes available for this mattress pad, which is about two inches thick. It is highly unlikely that you will not find a match for your mattress. The sizes for this mattress topper are queen, king, twin, twin XL, full, full XL, California king, and Olympic queen. And it is relatively lightweight at just 12 pounds. This mattress pad is made in the United States. Its plush top is made from rayon blended with bamboo fabric. It is very silky to touch, and lets you feel comfortable that you will surely have a peaceful slumber. The bamboo fabric also breathes well, which makes it a good way to balance ‘warm’ mattresses. This mattress topper is also filled with RevoLoft Cluster fiber, which goes through an engineering process for creating fiber balls that trap the air. This design is intentional, as it would enable the pad to retain its shape even after years of use. It also lets more airflow. With a soft surface, this mattress pad is very ideal for sleepers who complain of different aches, from arthritis to chronic bad back, and neck aches. If you’re one of them, you will love resting on a bed with the mattress pad on top as your body will be able to get pressure point relief. Many of the owners of this mattress pad say that sleeping on it can be compared to resting on clouds and marshmallows. Those comparisons indicate how soft the mattress pad is. But despite being soft, this mattress isn’t prone to sagging unlike other soft mattresses. The consensus among owners is that it is very durable. Moreover, it is a lot better than memory foam mattresses or pads because it doesn’t develop a “memory” of a spot that you laid on. When you lay on it, the mattress compresses a bit. But it won’t collapse. It will give you a soft and superior support, but not sink too much that can cause back pain and other aches often associated with thick memory foam mattresses and toppers. This item is backed by a one-year warranty. In case you find that there’s a manufacturing defect in the mattress pad, you simply have to e-mail the manufacturer, ELuxurySupply, and the company will be replacing your mattress pad. There are plenty of things that make this mattress pad a very good buy. In terms of maintenance, you don’t need to exert a lot of effort to clean it. Simply toss it into the washing machine to maintain its good quality. This mattress pad is washing machine-ready. Many owners say that the mattress pad can withstand years of sleep and frequent wash cycles. Reviewers on Amazon.com indicate that their mattress pads have withstood the test of time, so to speak. It is not surprising at all because this mattress pad is made of blended material that can last for many years. Generally speaking, this mattress pad is highly rated by those who have bought and slept on it. One satisfied customer wrote on Amazon.com how this mattress topper saved him a lot of money. He said that he initially contemplated on buying a new mattress but was discouraged by the prohibitive prices. He took a chance on this mattress pad after seeing the many positive reviews by Amazon.com users. He remembers receiving the mattress pad a day after placing his order. The mattress pad came in a small box. It had no odor and the material felt soft and silky. He said that it felt tight and stretchable, too. The size was also fit for his queen size bed. He compares sleeping on this mattress pad as if he was sleeping on clouds. The reviewer says he prefers his mattress to be extra soft, and because his old mattress has sagged, he could no longer sleep as comfortably as he used to do. But this extra plush mattress pad has saved the day, so to speak, because he now sleeps better with it. 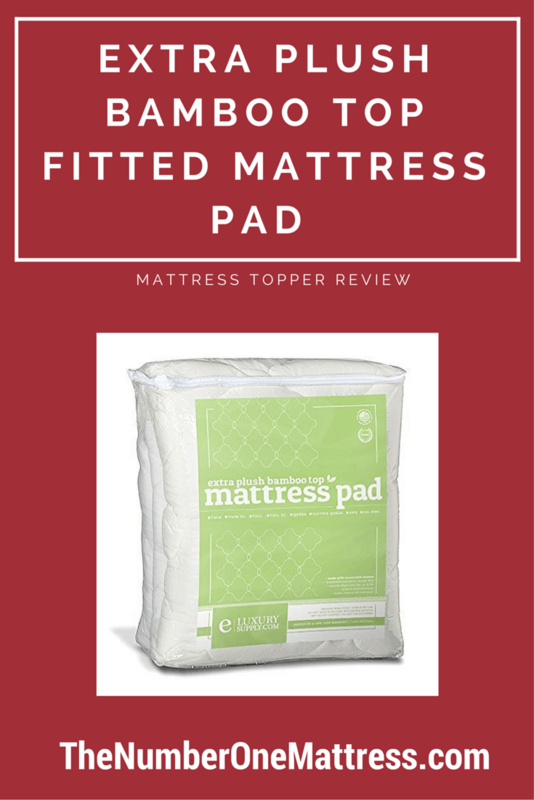 The reviewer says that aside from being able to save when he purchased this mattress pad, he has also extended the life of his worn-out mattress. He thinks he no longer needs to buy a new mattress, at least in the next five years. Another reviewer, this time a wife, says that she and her husband longed for the type of sleep they often get when they check in at hotels. But they were hesitant to spend a thousand bucks on a new mattress especially since there is only two years old. So they tried this mattress pad with the hope that it can give them a softer cushion. The wife describes herself as petite while her husband is a big, muscular guy who weighs more than 200 pounds. She says the mattress topper has performed well, giving them a more comfortable surface to sleep on. It also stays in place, at least in her experience. She adds that she washes it every other month, and the fact that it doesn’t emit any odor means there’s no urgency to clean it every now and then. But not all reviewers on Amazon.com are happy with this mattress pad. Most of the disappointed customers point out that the mattress pad is too soft for their taste. Others say that it shrinks after years of use, although that may be understandable. Other issues have to deal with the limited warranty coverage given by the manufacturer. The truth is that you don’t need to spend $1000 or so for a new mattress if you want to have a more peaceful sleep. Buying a mattress pad instead seems like a better idea. Aside from saving money, you don’t also have to throw away your existing mattress. A mattress topper can also prolong the life of your old mattress. The Extra Plush Bamboo Top Fitted Mattress Pad has been getting very good reviews on Amazon, and for good reason. It is very comfortable to sleep on. It ‘breathes’ so waking up sweaty is very unlikely. And it can give tired bodies a good cushion for the rest of the night. With all these qualities, it would be very hard for you not to give this mattress pad a second look.